We’ve got a dubious one here today folks! Logisys wouldn’t dream of sending one of these things out for review, but Glorious Leader stepped up and threw down some cash to make it happen. This thing cost $14.50 shipped with tax, the big question is: Will it explode? If not, will it actually function well enough to run a computer safely? For answers to those questions and more, read the rest of the article! 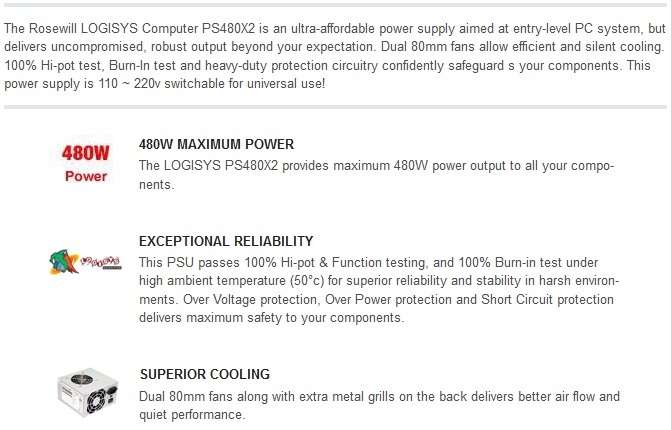 We’re going with screenshots of the Newegg Product Page here, plus a photo of the PSU label. Newegg listings don’t copy/paste for beans and I’m certainly not interested in typing it all. Rosewill Logisys? That’s brave. 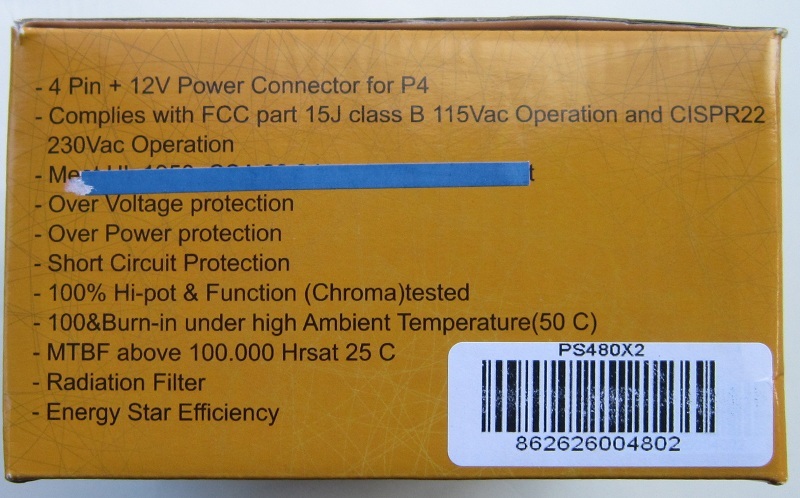 Exceptional reliability is a claim I find vaguely amusing from a $14.50 PSU. OVP/OPP/SCP is a claim I doubt. As for Superior Cooling, I have to ask the question: “Superior to what?”. 480 W, and no PCIe connector? Brutal. We’re a bit short on connectors in general really. 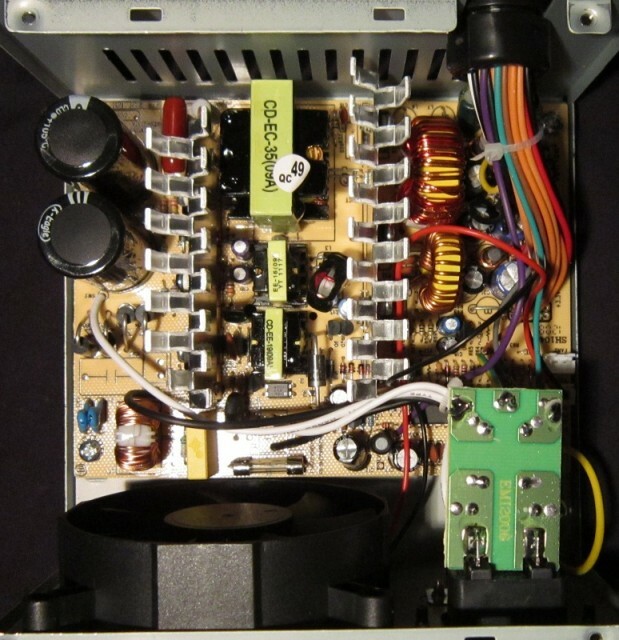 When they say “Complete Radiation Filter” I’m assuming they mean a transient filter on the input, transient filters keep transients out of the PSU as well as preventing the PSU from causing transients. Alternatively maybe it’s preventing gamma radiation from doing something, who knows. I’d be very surprised if this thing survived 100% load (whatever it might be) at 50 °C. 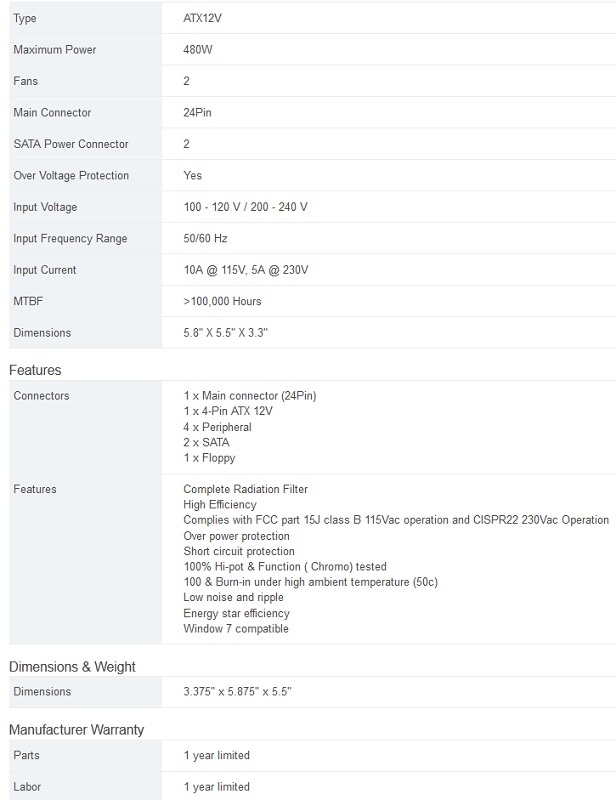 Here we have the output chart, which thoughtfully says 330 W for the main three rails and 480 W for “Total Max Output”, while saying that the minor rails can cough up ~20 W between them. Where’s the other 130 W come from? The box is hilariously tiny and features a piece of blue tape over the features line talking about having UL certification. I can’t say that’s a good sign. 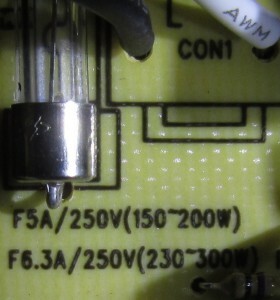 We also see “480 W” mentioned a lot. We’ll see. Given what this weighs (roughly nothing) I’d be shocked if it managed to put that much out. If you’re brave, you can open the box. The PSU doesn’t get any padding, bummer for it. The power cord is staggeringly thin, I won’t be using it for the testing. I’m scared of it. Rear Of The Unit, I see Another Fan! The PSU is, not surprisingly, done up in classic grey. I have to admit that it causes some nostalgia for me. 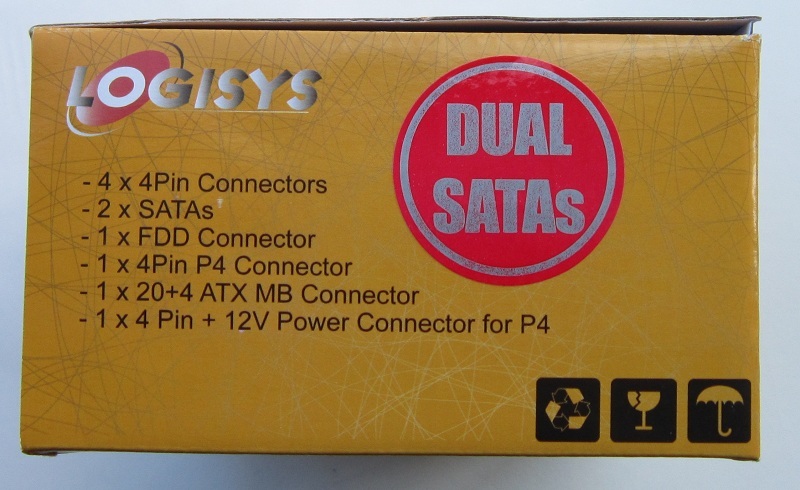 I’m having flashbacks to building systems in the 90s, on AT platforms (continuing through early ATX stuff, exciting times…), though some of those PSUs weighed more despite being rated at 200 W (which was big, at one point in time). I actually kind of like it, probably due to the nostalgia. I want to see someone do an entire build in this grey color, it’d be hideously glorious. 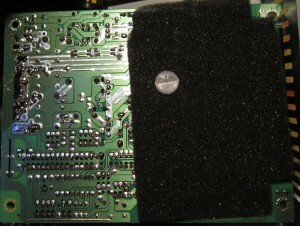 We see the classic “QC PASS” sticker “proving” that this unit works. It also says “Warrant void if removed”, I’m assuming they mean warranty. If they actually mean warrant, this is going to be an extremely popular PSU. I’ll be cutting it later in the review so I can see what’s inside, but I won’t remove it. Not much in the way of cables, we get the two promised SATA connectors plus four Molex, one FDD, one 4P CPU connector, plus the ATX20+4P motherboard connector. The motherboard connector is my favorite sort, it slides together so it will not come apart unless you want it to. All wires are 20 gauge, thinner than the recommended 18 gauge. Much to my surprise, this unit did not explode. In fact, try as I might, I could not kill it. Over ~290 W load it would simply shut down and not restart until I lowered the load. That goes for hot or cold, and is despite hearing crackling sounds from inside the unit on two occasions. The 12 V Rail managed 3.6% regulation, not fantastic but not as bad as expected. 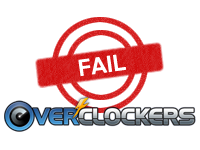 The 5 V rail did 5%, which is right on the maximum limit per ATX specs. 3.3 V came in at 2.45%. This looks like a group regulated design, which should shock nobody. With intake air over 26 °C at the top end loads >240 W) the unit went into thermal runaway fairly promptly, with Kill-A-Watt readings rapidly ramping up until the unit shut down. For example, at the max load in the charts it would sit at 405 W for a while, then do 406, sit there, 407, sit there, 409, sit a bit, 412, 415, 420, 430, 445, shutdown. It started right back up every time, and a sustained load under the wattage that caused runaway+shutdown was happy to run for quite a while (despite hot electronics smells). The fans are far from quiet and move a lot of air, as you can probably guess from the tiny delta between intake and exhaust air temperatures. Logisys is not messing around when it comes to airflow. Other than completely failing to put out 330 W (let alone the 480 W plastered all over the box), this unit actually manages a pass in this section, just barely. Rather than time consuming pictures we’re going with a chart here. The ripple did away with the spec and headed south promptly once loaded. At 120 W it’s within spec on 12 V, but fails 5 V by 38 mV and 3.3 V by 18 mV. 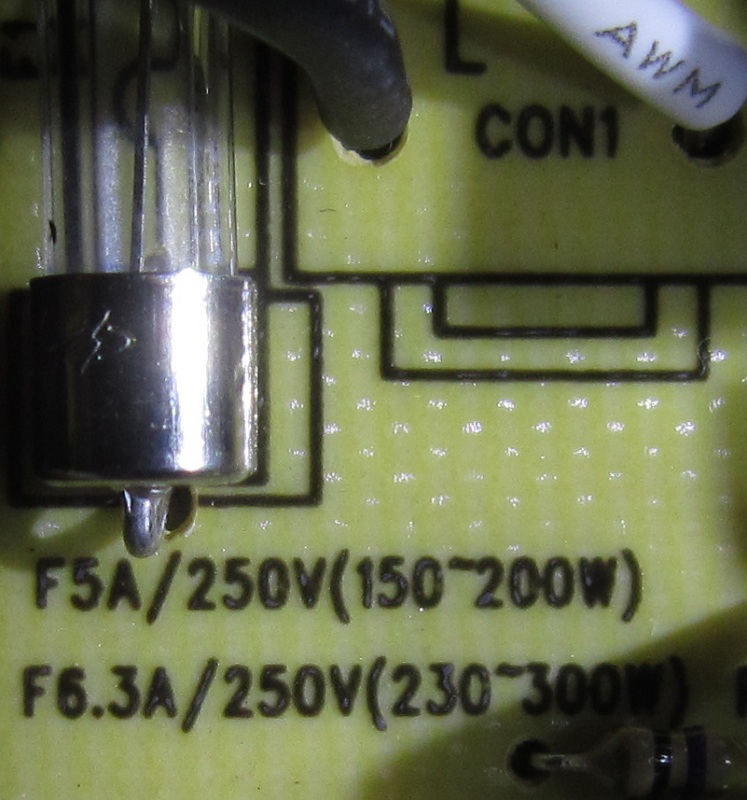 At the closest to its rated wattage I was able to pull, it has violated 12 V ripple by 80 mV, 5 V ripple by 30 mV, and 3.3 V ripple by a staggering 160 mV. So much for being within spec. This does away with the ability to safely power much of anything unfortunately. It’ll power a computer, but I strongly recommend against trying it. This ripple is not the brief transients that an input filter on a GPU or motherboard can easily mop up, this is long duration, instability causing, ripple. Not exactly beefy looking, but not quite as anemic as expected. I don’t see any radiation shielding (the metal case will stop alpha/beta radiation, gammas will laugh at it as they cruise through), there is a transient filter though. Let’s step through it like we usually do. 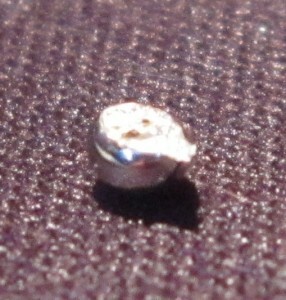 The metal edges are thin and sharp, extreme care was taken to prevent cuts. 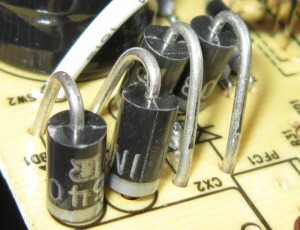 The transient filter is remarkably complete, there’s a fuse (5 A), four Y caps, two X caps, two inductors and a thermistor for inrush protection. No MOV/TVS Diode though. 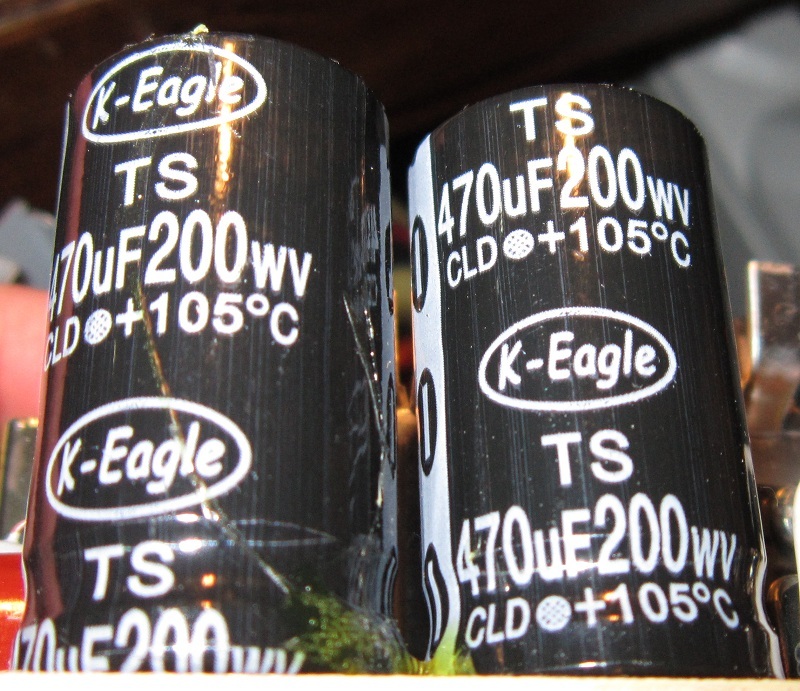 The presence of four discreet diodes for rectification is not a good sign, nor are the “K-Eagle” primary caps. 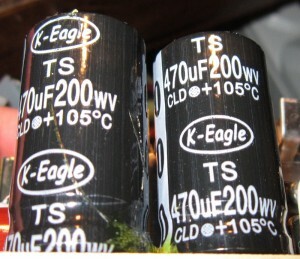 I cannot find any data at all about K-Eagle’s quality, I can’t imagine it’s high. 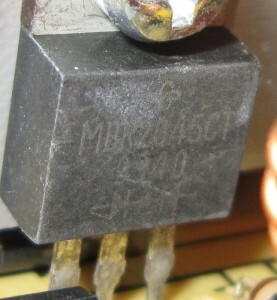 There are two caps for voltage doubling purposes, you only get the 470 µF from one cap as far as holdup time goes. 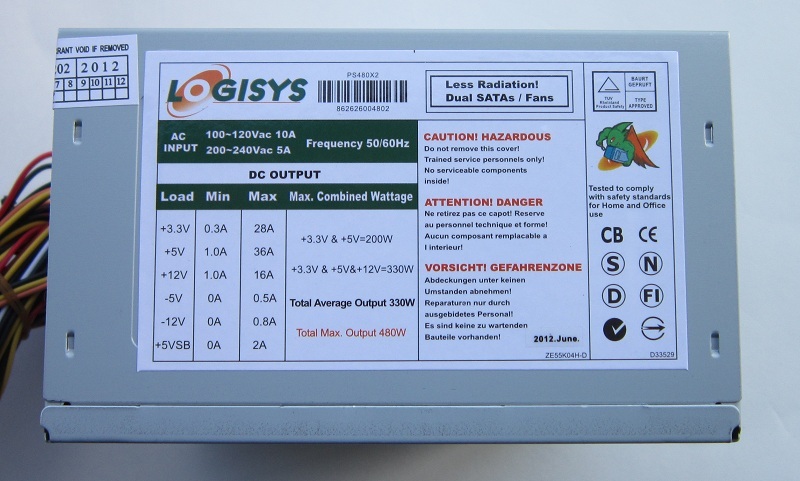 The diodes are rated at 3 A and 1000 V each. 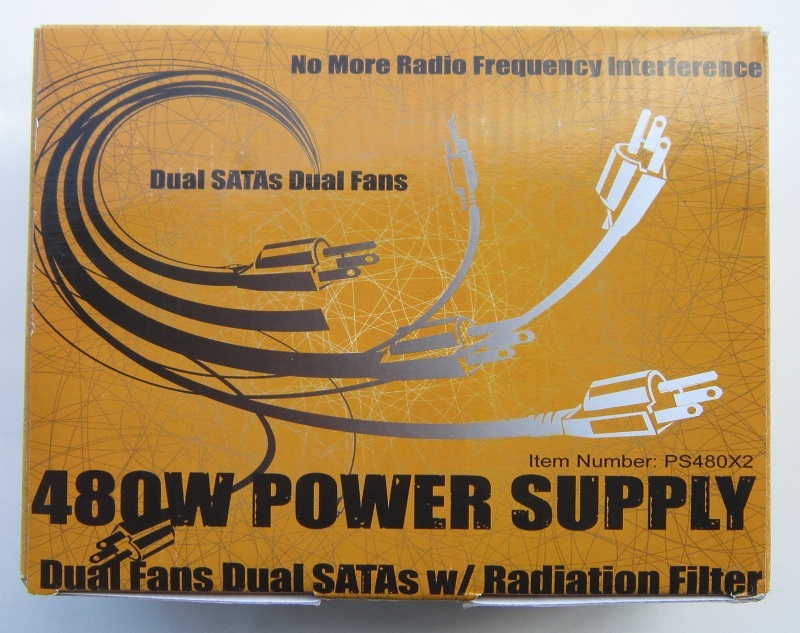 That gives us roughly six amps of wall power to work with, so around 660 W input power. 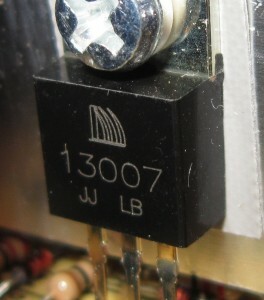 I’d much prefer to see a standard bridge rectifier, but for a 330 W unit this is actually enough. For primary switches we have a pair of 13007 (400 V, 8 A) transistors (not MOSFETs), 5 VSB gets the CM2N65F, about which I could find nothing. Again while the 13007 is far from an excellent part, it’s enough for 330 W in theory. The secondary side is a bit on the anemic side, as might have been guessed by the ripple results. The capacitors for the positive voltages are from “BK”, I’m assuming that’s not short for Burger King, though judging by the ripple performance it might be. 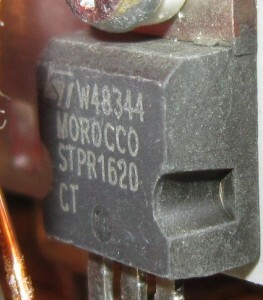 12 V gets a single STPR1620 (16 A, 100 V) diode pack (not Schottky, mind you), matching its rating exactly. 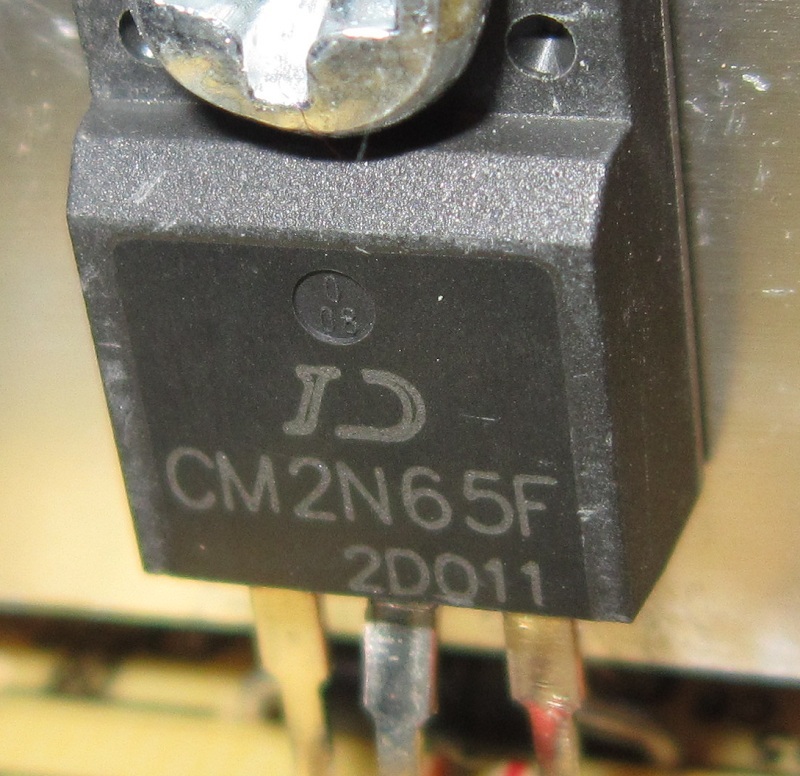 That’s not a good sign, as diodes rarely appreciate running right at their maximum. 5 V gets a single FCH30A06 (30 A, 60 V), well under the rail’s rating of 36 A. 3.3 V gets a single MBR2045CT (20 A, 45 V), again just a touch under its rating of 28 A. None of this stuff is large enough in theory. Interestingly the 5 V and 12 V rails get a Pi filter, that is to say a capacitor-inductor-capacitor filter. Not a very big one, but it’s there. 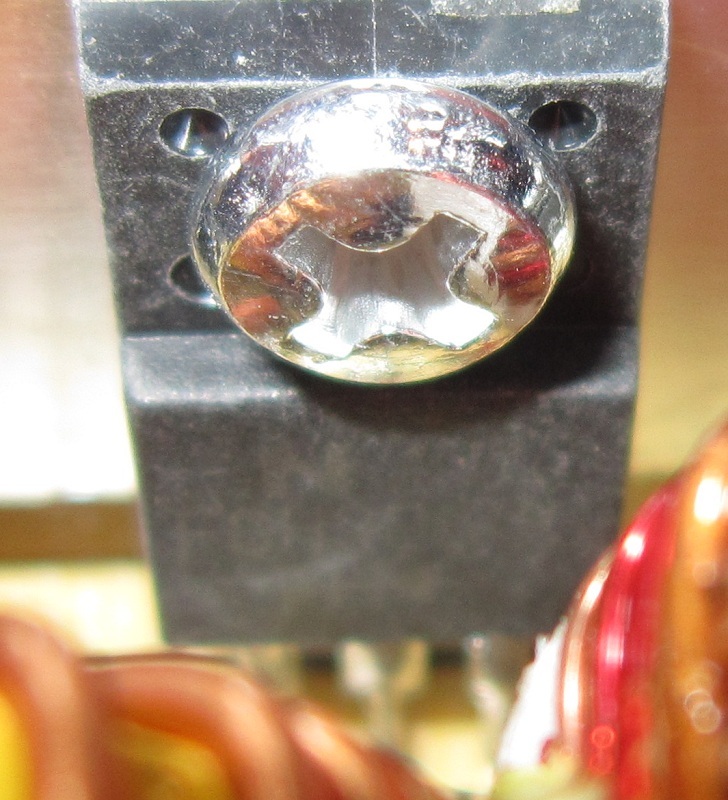 This is likely why the 5 V rails ripple control was so much better than the 3.3 V rails ripple control. The poor 3.3 V rail has a PCB space marked out for an inductor, but gets a jumper instead. Controlling this operation is a EST7502C, it features OVP/UVP for the three main rails and runs the primary switches as well. One other OVP input is provided for. SCP/OPP/OCP is not supported. This makes the shutdowns I experienced rather more interesting, I suspect that the additional OVP input is being used for OPP somehow. I can think of a couple ways to do it in theory. Two things come to mind when looking at the bottom side pictures. 1) Open cell foam doesn’t prevent shorts very well. 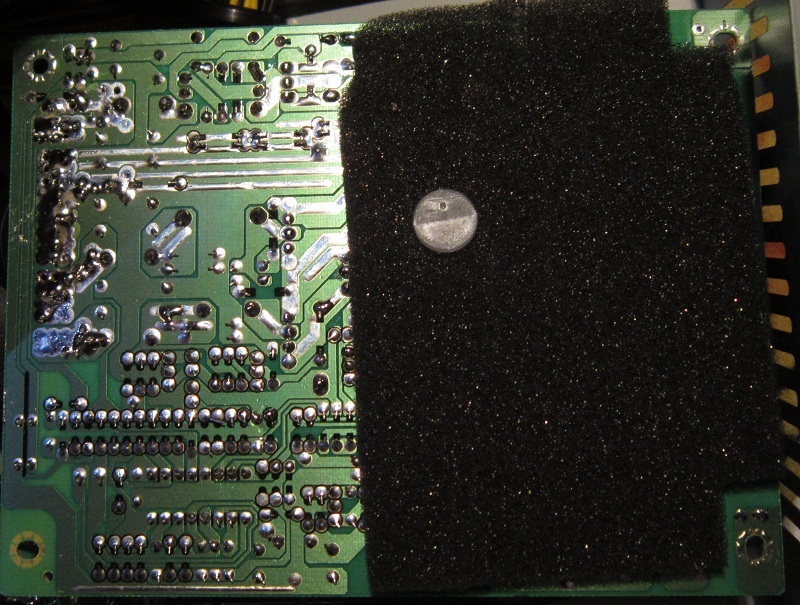 2) No surface mount components, at all. There are a few smears of solder by the output leads, that’s not a good thing. 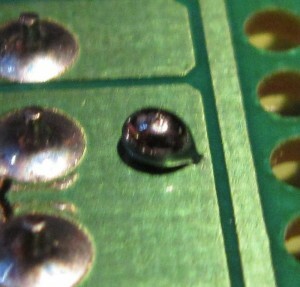 The 2.49 mm solder ball sitting near the main transformer outputs is a rather worse thing. 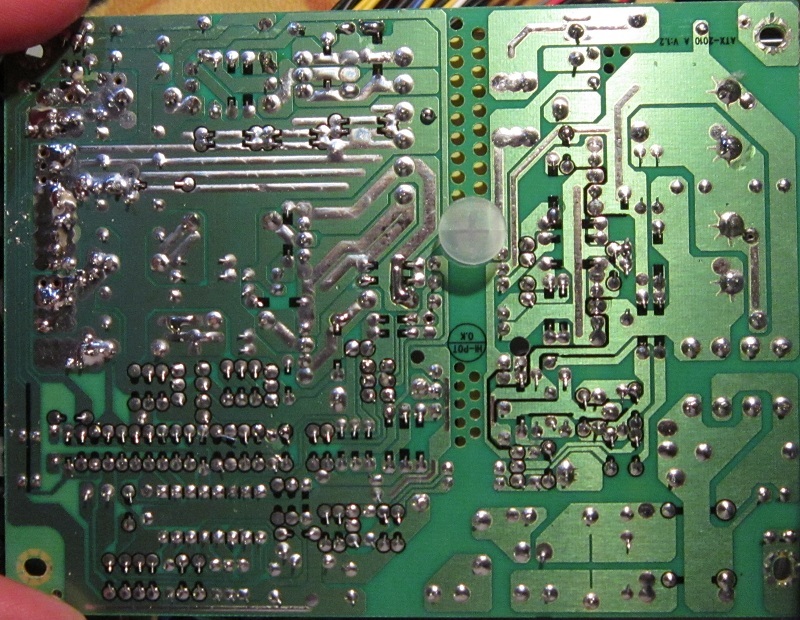 Were it not for those two issues this unit would get an excellent soldering rating. So it goes. The solder ball was stuck to the PCB under the main transformer, as long as it stayed there it’s not an issue. If it rattles around and bridges the wrong connectors, blammo! 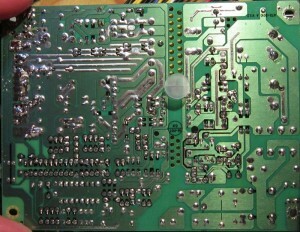 To finish this section off, a few pictures of text to be found on the PCB. 180 W to 300 W. Not 330 W, certainly not 480 W.
Is This The Guy That Designed This? Same Tape Rating Of Fuse! You heard it here first folks, fuses have tape ratings! 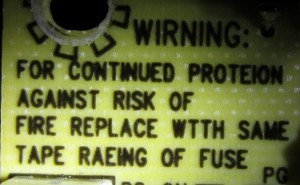 I rate this fuse as “masking tape”. The Logisys PS480X2 surprised me, I was expecting total garbage and I only got mostly garbage. 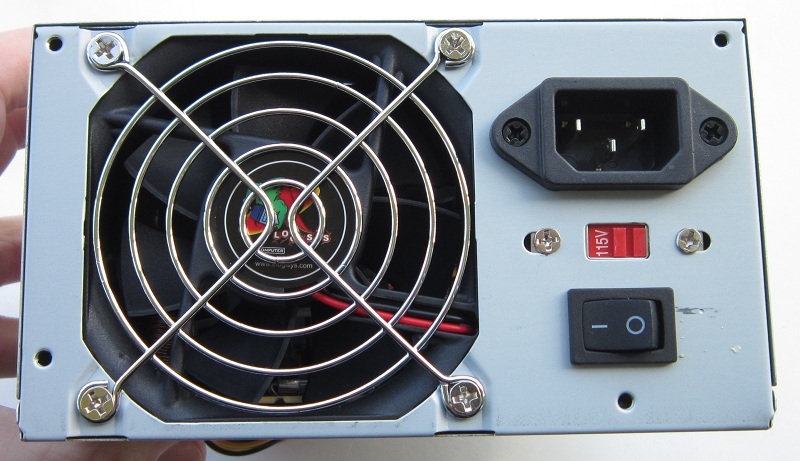 I strongly recommend against trusting this PSU to do much of anything beyond doorstop duty (and really, it doesn’t weigh enough for that either), but it didn’t explode and actually kept the voltages within spec. The ripple control was lousy bordering on horrid. Nothing good can be said about the ripple. The regulation was within spec, just barely. 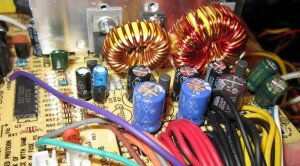 The build quality is not so hot, BH capacitors aren’t known for being top notch. They’re not exactly known to be horrid either, mostly they’re simply not known. I can’t say I trust them or the K-Eagle primary caps. 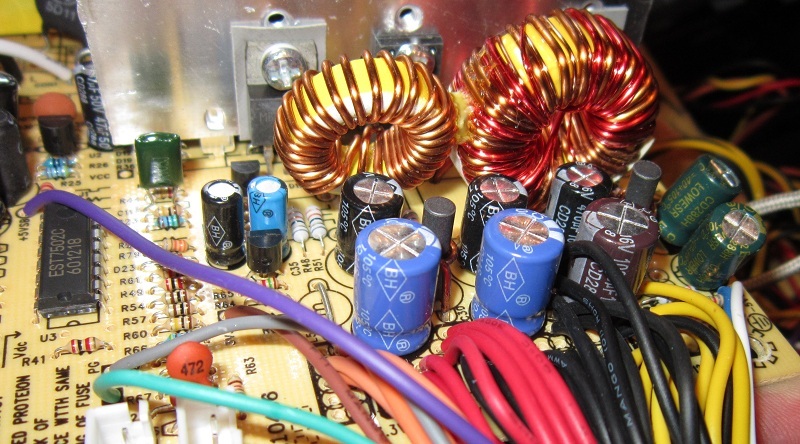 The secondary rectifiers are all either under-rated or just barely rated for spec, not good. The looks are generic grey, they get a Bleh too. 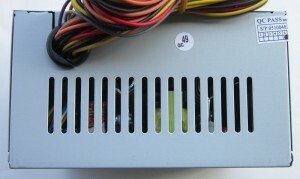 The connector selection is awfully skimpy, two SATAs and four Molex, plus one FDD. The power cable flat out scares me, I wouldn’t use it on a nightlight, let alone a PSU. This unit cost $14.50 shipped with tax, that’s very, very, very cheap and brings us our second ray of hope for the unit. Cannot deliver 330 W, let alone the box’s 480 W.
All told, the PS480X2 did far better than expected, but still falls well short of an approved badge. It’s almost into “Meh” territory, but the complete mismatch of the ratings and reality, plus the >200 mV of ripple on the 3.3 V rail, land this unit in the Fail category. 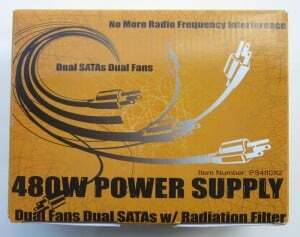 I strongly recommend paying the extra few bucks to get a known good power supply, you’d be mighty unhappy if your attempt to save <$30 cost you hundreds of dollars in ripple-fried equipment. Im quite sad it didnt blow up either... oh well. 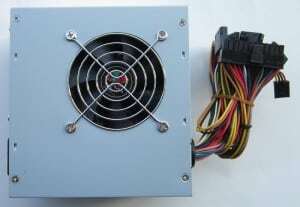 Nice review of a POS PSU! This one was fun, not exactly sellable, but fun. 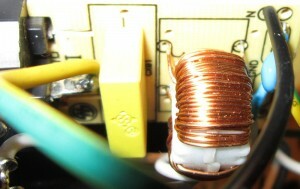 I spent some time upgrading the output bits with maybe $4 of capacitors and inductors. Unfortunately I put one of the caps in backwards (whoops), after it blew up and I figured out why the unit was shutting down so fast I put one in the right way. The ripple was fantastic at that point, but there was a SNAP and no more output, one of the 13007's failed and is all rainbow colored. If it weren't for the 3.3 V ripple I probably would have given this unit a Meh instead of a fail. I definitely wouldn't use it for, well, anything really. Did we send an e-mail to Logisys pointing them to the review? LMAO! "The big question is: Will it explode?" I read that on Tom Dickson's voice. Oh, and I laughed out loud at this. Really the world needs more of these gutless wonder type of reviews. 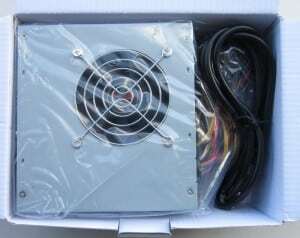 The more we can bring the failures of cheap PSUs out into the light where normal people can see it the better. Actually that's an epic typo, that should have been 4.99, no clue at all how it became 4.31. With regards to calculating regulation there are two thought processes on that. The ATX spec says the voltages need to be +/- 5%, so in 5V's case that's between 4.75 V and 5.25 V.
Most reviewers give you the regulation numbers somewhat differently, we take the highest voltage and divide by the lowest voltage, that spits out the regulation percentage (roughly, if you want to be able to copy/paste the percentage directly, it's (Highest / Lowest - 1) * 100. Or you can just mentally remove the 1 and move the decimal two places right). The ATX spec doesn't actually care if the PSU ranges from 5.25 to 4.75 during testing, just like it doesn't care whether ripple is right at the maximum or far lower. It just wants things to be in spec. Now a case could be made that if it boots at 5.25v and then droops to 4.75v it did not maintain +/- 5% of the original value. It's a complicated subject, really. Reviewers on the other hand have rather more stringent requirements when it comes to such things. Partly because we have to, otherwise the only approved PSU would be that which is cheapest and within spec. That's boring, and nobody'd read the reviews either. 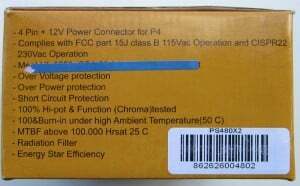 Plus some people (extreme benchers, server people, that kind of thing) do need PSUs with minimal voltage deflection and minimal ripple. Personally, I take the ATX spec to mean that it needs to be within 5% of the nominal value and stay within a range of 5% also. Pretty much. 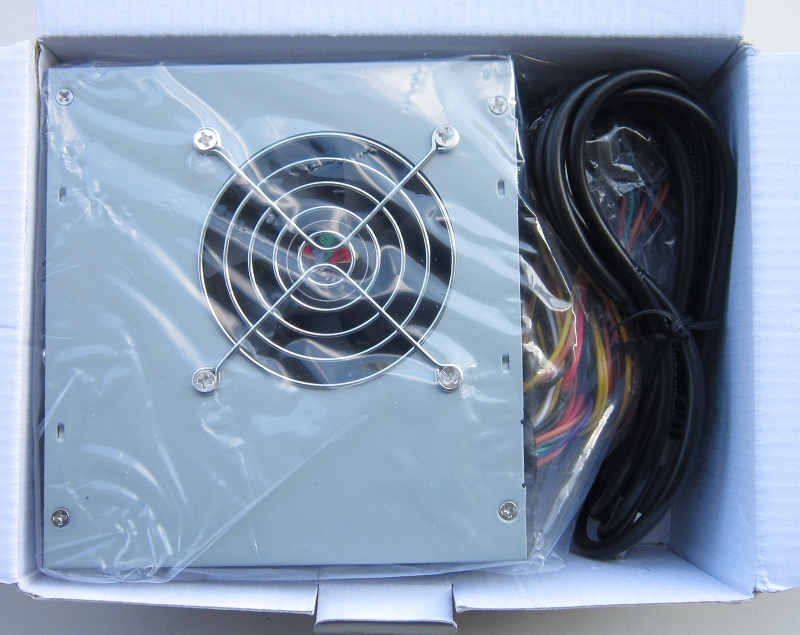 The goal was to see if it'd be a functional PSU at $18.50 shipped. The answer was: Not with those parts. That is dangerous. Funny, but dangerous. laughing so hard... or should i say lafying.